"Mister Ron's Basement," a unique and extremely popular podcast, using the newest of modern mediums to re-popularize long-forgotten humorists is just about to send out its one millionth download. The show, which offers readings of humorous works from the public domain by well-known authors such as Mark Twain and O Henry, and long forgotten writers like Ellis Parker Butler, Stephen Leacock, and Fanny Fern, has been drawing in an average of 7000 to 8000 downloads a day in recent months. There are a few podcasts that feature readings of public domain books and stories, but none are quite like Mister Ron’s Basement. In less than a year, “Mister Ron” Evry’s podcast topped 900,000 downloads by the end of January, and is expected to hit the One Million mark sometime in February. Podcasting is basically a form of internet delivered radio that anyone can create, and thousands of people have done this so far, bypassing the traditional mass-audience based broadcast stations. Evry's search for funny material in the public domain (his operation is too small to deal with paying royalties) has been essentially limited to works written before 1923. By digging around in an ever-growing collection of old books, and researching scholarly papers on the internet, he has discovered a wide variety of mostly forgotten literature written to tickle the funnybones of generations long gone. There are over 270 episodes of “Mister Ron’s Basement” available online so far, and Evry cranks out a new one every day, seven days a week. 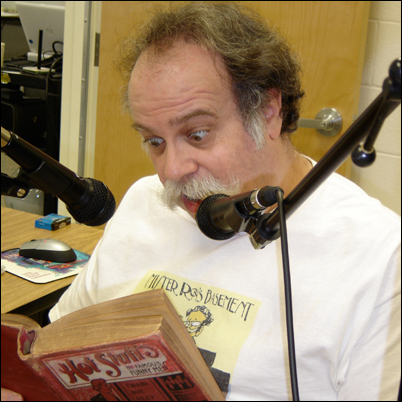 Each episode of “Mister Ron's Basement” includes a brief musical introduction, culled from the earliest days of recorded music -- extremely old wax cylinders and brittle 78s. "There is some dispute over whether recorded music from a hundred years ago or so is still covered by copyright, even when the sheet music has entered the public domain," he explains. The web server slapcast.com has provided an obliging and reasonably priced hosting service for Mister Ron's Basement since the first episode. Roger Strickland, the proprietor of Slapcast, has an amazing policy of not charging more for heavy bandwidth use -- encouraging ordinary people to make popular podcasts. “Slapcast has also been working with an increasing number of public schools using the medium as a means of expression for students,” says Evry. The list of authors represented on “Mister Ron’s Basement” could easily be considered a “Who’s Who?” with a question mark, as it includes many once popular, but now forgotten writers such as Thomas Bangs Thorpe, Fanny Fern, Marietta Holley (who sold ten million copies of her books in the late 1800s), Max Adeler, C. B. Lewis, Bill Nye (the 19th Century Guy, not the current TV Star), and George Horatio Derby, among others. A recent experiment in reading funny pieces by Benjamin Franklin to commemorate his 300th birthday resulted in a temporary drop in download numbers, which popped right back up again the following week. Some weeks, the Basement spotlights individual authors, and other weeks center around particular themes with a variety of writers. Past weeks’ themes have included New Orleans authors, funny horror stories, women writers of the nineteenth century, children’s folk tales, and recently, commemorating Western Union’s ending telegram service after 150 years, stories featuring telegrams. Every weekend, the Basement is host to short, wildy funny stories from the turn of the last century by George Ade. Humorist Jean Shepherd often read Ade’s stories on the radio years ago, and Evry is continuing in thiat tradition. Mister Ron has more in store for future episodes. “I have discovered that with the advent of internet booksellers, and auction sites, it can often be much cheaper to buy hundred year old books than new ones -- and they’re usually funnier!” says Evry. His research has taken him deeper and deeper into the unchartered territory of old humor. To celebrate the one millionth download of “Mister Ron’s Basement,” the day after that number is reached, the program will be running a promotional contest that will offer an iPod and other great prizes to listeners. This should attract even more attention, and expose the Podcast to more listeners eager for funny programs. Businesses trying to reach upscale audiences may want to consider advertising on Mister Ron’s Basement. Ad insertion is available for new and many back episodes on a simultaneous basis, to reach large numbers of listener at competitive rates. Advertising representation for the Podcast is handled by Gregory Galant at RadioTail Advertising at (800) 790-2096. To find out more about the "Mister Ron's Basement" podcast, journalists may contact Ron Evry at (703) 490-1534 or by email at revry at panix.com. Photos and graphics are available upon request. All episodes of the program can be downloaded from the iTunes Music Store or from http://slapcast.com/users/revry.